Do you get phone calls from your engineers asking for directions to their next job? Are you using websites like AA route planner to work out the quickest route for your engineers? With Okappy job management software, you can view the latest location and traffic conditions from the Radar screen, you can also send directions to your engineer's mobile phone. 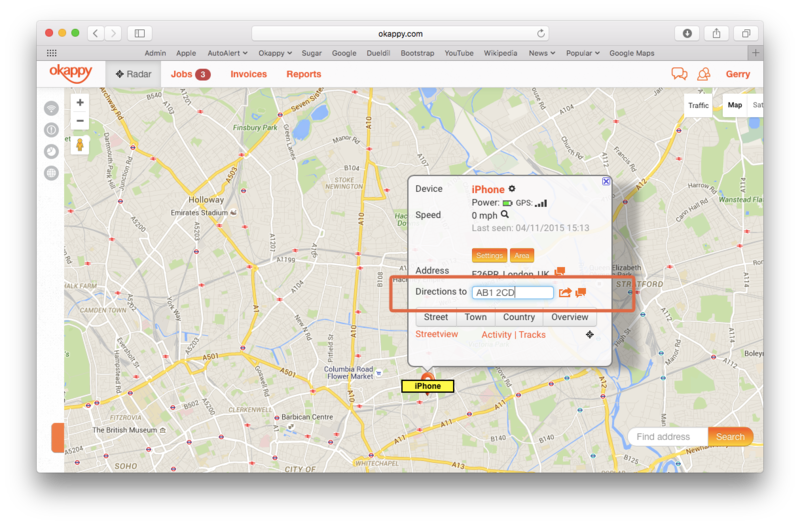 Below is a quick guide showing how you can send directions from Okappy on your computer to your engineer's mobile phone. Click on the name of your engineer from the Radar screen. This will display the following pop up. This opens the Send Message box. From the drop down, select the name and telephone number of the engineer you want to send the directions to. Then click Send SMS. Your engineer will receive a SMS text message on their phone containing the directions. Simply click on the message to load the directions in Google maps. If they have the Google maps application on their phone the directions will be shown within the app, otherwise the directions will be shown in Google maps in their browser.